The piano was 30 years old when Debussy composed Images II. While those works feel freeform, they are anything but, inasmuch as they are scored over three staves with specific dynamic and expressive instructions. Cloches à travers les feuilles evokes church bells in the countryside on All Saints Day; Et la lune descend sur le temple qui fut (a perfect stately French alexandrin [12-syllable] verse line is part of the inspiration) conveys a moonlit setting in a land of antiquity, and Poissons d’or the darting movement of goldfish in a pond or bowl, inspired by a Japanese woodblock print on Debussy’s wall. The distinct atmospheres would be difficult to produce on a modern Steinway. Lee mastered the Érard and the music alike: every note was clear and rang harmoniously; she handled the instrument’s potential power enchantingly—there are few fffs in Debussy, but quite a few ppps. Composed three years before this instrument was made, Camille Saint-Saëns’s Allegro appassionato in C-sharp, op. 70, followed. While Saint-Saëns, like Debussy, never owned an Érard (both had Pleyel uprights), he certainly played Érards in public. This work, like most of his, calls for virtuosic display—of the wrists and fingers, but not the arms and body. 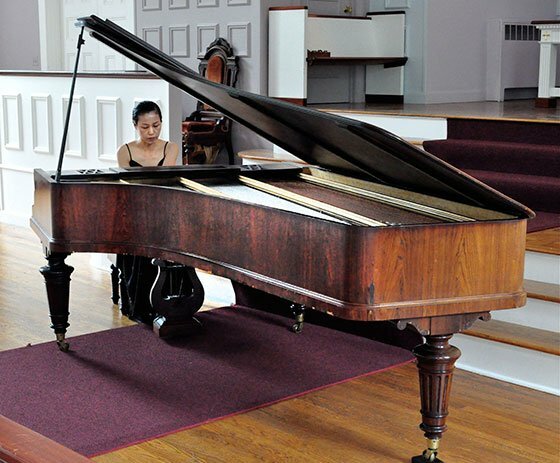 Lee’s approach is very much in this tradition: she keeps her hands and fingers close to the keys, the only arm gestures occurring at the conclusion of a piece, when she lifts her hands away. The three hypervirtuosic arpeggiated sections of the piece are separated by two calmer interludes that offered a sense of the tradition from which some of Debussy’s evocations came, again achieved with masterful dynamic control. Ferruccio Busoni’s transcription of the Chaconne from Bach’s Partita no. 2 in D-minor, S.1004, closed the first half. The Extra-grand modèle de concert was still in production when Busoni died, in 1924. This offered dramatic contrast with the Images II set because, while it too demands virtuosic fingers, its mien further comprises solid structure and crafted formal progression. The Érard revealed hidden tonal beauty I had never heard before, because notes remain clear and distinct and harmonious while differences across registers from top to bottom produce more harmonic diversity than a modern instrument can. After the pause, Lee offered nos. 8 and 9 of Emmanuel Chabrier’s Dix Pièces pittoresques: Improvisation and Menuet pompeux. Chabrier’s piano music was admired by Debussy and Ravel. The second of these pieces was the latter’s inspiration for his Menuet antique. The title is a false lead, because it is not a minuet at all in rhythm, the beat never falling where expected, making it anything but stately. Chabrier, although a trained pianist from childhood, and a virtuosic one with a reputation like Liszt’s of leaving instruments incapacitated, was outside the musical establishment. Self-taught as a composer, he neither studied at conservatory nor performed on a public stage. He could therefore do as he pleased, and did. These 10 pieces revolutionized French piano writing, yet no one plays them. It was a treat to hear them on this instrument, because the only piano Chabrier ever owned was an Érard, and they were written on an instrument that produced this very soundscape, which Lee realized to perfection. The Improvisation is derived from Robert Schumann’s approach but points toward the Impressionists, and ends in delicate calm. The program closed with César Franck’s Prélude, choral et fugue, harking back to Bach and hence a perfect echo of the Busoni transcription. Primarily an organist, Franck rarely played piano in public, nor did he write much for the instrument, but he did teach at the Paris Conservatoire, where Érard was the house piano. Like Chabrier, he sought to exploit the differences among registers that modern pianos seek to eliminate. Consequently, the works make more sense, have more character, and sound better on an instrument that can offer them. Structure stands out, in Germanic fashion—Franck is the most Germanic of French composers—and this work is also cyclical, repeating the beginning of the Prélude at the very end, bringing us from the climactic Fugue back down to a calm resolution. Thanks both to instrument and to instrumentalist, the Bach-Busoni and this Franck have never sounded better. Lee rewarded the enthusiastic audience with Debussy’s Arabesque no. 1 in E major, taking us back to the beginning of an enchanting journey. Ed. Note: This review replaces an older Lee/Frederick/Ward review which was inadvertently submitted and posted; apologies for the confusion, and thanks as always to alert readers for quality control.